. . . [Barenboim and Argerich reflect] the density of Stravinsky's orchestral scoring and give the music a [dark quality, an interpretation evocative of the shockwaves of the Paris premiere] . . . The opening selection, Mozart's Sonata for two pianos, demonstrates these two pianists' contrasting musical characters. Barenboim's instinct is to sing out, to play to the very back of the hall -- although never at the expense of the cantabile that is so essential in all of Mozart's music. Argerich opted for the second piano part . . . She acts in a way as a moderating influence on Barenboim's flights, thanks surely in part to her years of experience as a chamber musician . . . the central slow movement is beautifully shaped and phrased, and the finale, briskly taken, is properly bubbly and joyful . . . The main attraction of the evening, though, was surely "The Rite of Spring" in the two-piano arrangement Stravinsky made prior to the work's infamous premiere and which he performed in partnership with none other than Debussy. These two-piano bodges always draw from critics the cliché that one misses the orchestral colouring of the work . . . This shattering performance sweeps away all such notions . . . This is a tour de force of pianistic chutzpah . . . At the work's close there is a collective gasp from a packed Philharmonie audience before suitably riotous applause breaks out. Your reviewer gasped too. These two great artists can be heard, right from the opening of the "Allegro con spirit" of Mozart's Sonata for Two Pianos in D, K448, working around each other intuitively, two giants of the keyboard bringing their formidable artistry together. There is a real joy here in the way that they combine their two very unique personalities and personal ideas. There is a playfulness in the way they approach each other, vying for a voice yet dovetailing brilliantly together. And what a terrific coda. Barenboim and Argerich bring a lovely gentle flow, a leisurely walking pace to the "Andante". If in the "Allegro" two friends vied to tell their story, here we have a natural relaxed dialogue between friends. It is wonderful how each line of the music comes through distinctively whilst blending so well. This is a glorious played movement. What a terrific, rollicking "Allegro molto" they bring, at times no holds barred, full of energy and flamboyance, yet never losing sight of the finer nuances of the music. This is a tremendous performance . . . These two bring a freedom and breadth to Schubert's "Variations on an Original Theme" in E flat, D.813 with a fine rubato and flexibility of tempo as well as lovely little decorative details and flourishes, never losing sight of Schubert's inwardness in the more introspective moments. Their ensemble is spot on, as though of one mind, yet always creatively free. The more dynamic moments are absolutely tremendous, free and spontaneous. They produce a vital, dynamic sound particularly in the coda. Without doubt the most striking performance on this disc is of Stravinsky's four hands arrangement of his "Le Sacre du Printemps" . . . [in the "Premiere Partie L'adoration de la terre"] there is a lovely languid, almost ghostly feeling to the opening. As the music progresses these two pianists provide some fine overlaying of dissonances, absolutely wonderful, giving full vent to their freedom of approach and spontaneity, a real clash of two giants. There are tremendous dynamic, forceful chords as the dance rhythms become more dramatic. They build each surge and each climax brilliantly. Eventually the languid tempo returns around which there are fine decorations before the great dissonant outbursts and a terrific climax. As we are led into "Deuxieme Partie le Sacrafice" . . . the ghostly, other worldly atmosphere returns. There is often playing of great sensitivity and delicacy. When the dynamics and tempo suddenly increase these artists show a terrifically light touch in this intensely rhythmic music, with some fine pedalling. The music builds with quieter, intense passages to a formidable climax. I defy anyone to find a finer, more awe-inspiring performance of "Le Sacre". With a vivid recording and very little audience noise, except for the applause that is kept in, this new release is highly recommended. This is sensational: two of the world's greatest pianists coming together for a seemingly spontaneous joint recital that hits dizzy heights of excitement . . . can the adolescents' dance ever have sounded more eloquent than under Barenboim's fingers, or the spring rounds more hypnotic than Argerich makes them? Even in this seismically brutal music, neither of them ever makes an ugly sound, while in Mozart's Sonata for Two Pianos, K448 and Schubert's "Variations on an Original Theme" D 813, their flexible, improvisatory approach lifts the music aloft. The Stravinsky especially erupts like a volcano . . . [Mozart / Sonata for 2 Pianos K. 448]: Barenboim's light, singing touch in the Primo part keeps the andante spry, free of all preciosity. Here are two of the great living superstars of classical piano completely living up to their transcendent reputations in performance together . . . All of which is performed on the kind of level that gives virtuosity a good name, no matter what peevish puritanism one might bring to the conversation. The piece that may well make this disc an enduring classic in two-piano performance is their searing pyrotechnic performance of Stravinsky's two-piano arrangement of his "Le Sacre du Printemps" . . . I doubt strongly we'll ever again hear the likes of this performance of Stravinsky's two-piano version of "Le Sacre" in our time. One of the year's great classical discs. Stravinsky's "Rite of Spring" prompts several adjectives: brutal, revolutionary, relentless, terrifying . . . But elegant? Urbane, seductive, sensuous? This astonishing performance is all that and more. Few orchestral accounts equal the colouristic range on offer here, or what I can only call its spatiality -- its sense of breadth and depth. This is keyboard sorcery near the levels reported of Chopin and Liszt. No wonder the applause at the event itself (here trimmed) bid fair to outlast the performance . . . the Sonata is transformed into an exhilarating instrumental operetta, celebrating the reunion of close friends after a long absence. Joy, style and spontaneity abound . . . The Schubert variations -- enchantingly lyrical, beautifully paced and impeccably structured -- are surely beyond cavil. The mutual respect is palpable here, between the performers and from the holding-its-breath audience. The sound-picture is clean . . . attacks and timing are remarkably good for a live performance . . . The highlight for me is the Schubert Variations in A-flat, D. 813. Here, the artists' emotional responses and pianism mesh wonderfully, each sensitive to the work of the other and to the texture as a whole . . . the playing is full of life and love . . . this performance is certainly very special. The final work, Stravinsky's four-hand version of "Le sacre du printemps" is impressive on many levels . . . If there is one disc any pianophile should not miss, it is this one . . . The long-awaited coming together of two of our finest pianists . . . delivers everything it promises and more. The Mozart is a masterpiece in chamber music. Energy abounds in the outer movements in different ways: serious, celebratory and full of pomp in the first, scampering in the Finale, unspeakably tender in the Andante . . . [the Schubert] is pure deliciousness . . . ["The Rite of Spring" receives] a performance that exudes energy and gets straight to the heart of Stravinsky's score . . . the pianists transcend this, taking the gestural landscape by the scruff of the neck. Tellingly, even the quieter moments possess great power. The slow and desolate sections of the second part are mesmeric, leading to a "Sacrificial Dance" that, in sheer unstoppable verve, rivals any orchestral version.
. . . truly an historic occasion and one of the great musical events of anybody's lifetime . . . on the evidence of this recording their artistry has never been better . . . [Mozart / Sonata for 2 Pianos K. 448]: From the opening bars it quickly becomes clear that this is highly individual playing. The melodies are teased and caressed and tempi often adjusted to suit the material. This is particularly evident in the last movement. The two pianists take off at top speed and then cut the tempo by half to make the second subject more expressive. This is artistry of the highest order. The Schubert Variations on an Original Theme D 813 is equally fine . . . an eloquent reading of a beautiful but neglected work . . . The highlight of the concert is certainly the Stravinsky . . . a unique perspective on this great orchestral masterpiece . . . we are struck once again by the originality of the harmonies and rhythms . . . The result is some of the most exciting music-making one could hope to hear. The two artists are completely in sync and rattle through the technical challenges as if they didn't exist.
. . . [an] exceptional disc . . . the bright, happy and effervescent nature of Mozart's music is brought out as I've never heard it before. It seems clear that the very fact that these two childhood friends are making music together at this longed for occasion adds an essential ingredient that is utterly unique. There are few experiences in musical terms that are more satisfying than hearing performances of works you think you know in a way that makes you stop in your tracks. You submit to a new appraisal as it reveals aspects and nuances that you had been unaware of before. That is certainly what happened when I listened to this disc . . . [Schubert / 8 Variations on an Original Theme D 813]: The duo make it sound like a four handed pianist is at work with a single brain directing operations such is the coordinated precision of what we hear . . . Each piano duet version is a breathtaking experience and if I was pushed to come down in favour of one it would be the Argerich/Barenboim for the sheer energy that the live performance produces. It's something rarely equalled in a recording studio. The closing moments of the first part underline this; there is an absolutely tangibly manic nature to the playing here which sets the heart racing. As the second part opens in a comparatively quiet way the silence of the audience is remarkable and one can imagine that it was holding its collective breath; it must have been one of those totally unforgettable occasions . . .
. . . [besonders quirlig und packend klingt] die Mozart-Sonate in D-Dur für zwei Klaviere. Die Funken sprühen und die Beiden haben offensichtlich Spaß, sich die Bälle an zwei Flügeln zuzuspielen. Romantischer, aber nicht weniger brillant gelingt ihnen Schuberts Variationen in A-Dur. Ein Gespür für richtiges Timing, für Farben, aber auch für stilistische Unterschiede macht diese Liveaufnahme so gelungen . . . [Strawinsky / "Le Sacre du Printemps"]: Am Anfang betörend wie ein Lockruf, später ekstatisch und die jeweilige Stimmung immer zu 150 Prozent verkörpernd -- wenn man Argerich und Barenboim zuhört, wird man förmlich in die Musik hineingesogen . . . [die zwei lassen] hier Musik wirklich lebendig werden . . . [und kommunizieren] miteinander auf höchstem Niveau . . .
[Mozart / Sonate für 2 Klaviere KV 448]: Gemeinsam mit Barenboim gelang Argerich eine lebendig-frische Version . . . Schuberts Variationen über ein eigenes Thema in As-Dur [spielten] Argerich und Barenboim sehr langsam und kantabel. Die beiden sangen auf den Tasten, mit viel romantischer Poesie . . . Strawinskys "Sacre" in der vierhändigen Fassung . . . [klingt] ungemein kraftvoll und aufwühlend, ist von großer emotionaler Intensität getragen . 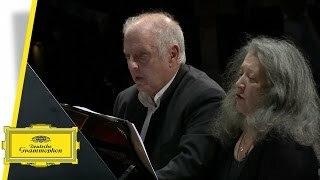 . .
Doigts de fée pour un quatre mains signé Argerich et Barenboim . . . Une délicieuse conversation hors du temps entre deux géants . . .